Switzerland's proximity to a number of notable neighbouring cuisines means that the country has assimilated much of what is good about French, German and Italian cooking. The country also has a handful of national dishes of its own that draw on Alpine traditions. On the whole meals are substantial, with the emphasis firmly on filling, hearty ingredients and bold, unfussy flavours. Frequently communal, meal times in Switzerland are meant to be social occasions and are an expression of regional culture. Fruit and vegetables tend to be organic and of good quality and most restaurants have vegetarian options on their menus. Fresh fish such as perch or trout is prized in the lakeside towns, whilst other regions specialize in producing dishes of veal or pork and beef Vaud sausages (Vaud being a canton on the shores of Lake Geneva). During the autumn months hunters might also provide restaurants with various varieties of deer meat or chamois, which is usually served in a stew. Although the Swiss have their own version of Marmite, Cenovis, and were responsible for inventing muesli at the end of the nineteenth century, they are perhaps best known for a couple of other traditional staples. Rï¿½sti is one such dish. Originally from German-speaking Switzerland, the dish comprises crispy, fried, shredded potatoes cooked as a flat cake. Depending on where you are in the country it is cooked slightly differently, with the German Swiss insisting on using butter or lard to fry the potato whilst the French Swiss use oil. Cheap and widely available, it is a substantial side dish in a restaurant in the evening or a hearty snack at all times. You can even buy it vacuum-packed in supermarkets. Fondue and raclette are also nationwide dishes, both deriving from the Swiss love of cheese. Fondue, from the word fondre meaning ‘to melt’, involves a large, shallow earthenware pot being filled with cheeses of several types and white wine or a shot of local liqueur such as Kirsch. Typically a moitiï¿½-moitiï¿½, or half-and-half dish, involves Emmental and Gruyï¿½re, but can include Vacherin Fribourgeois or Comte cheese. This is then heated so that the cheese melts, and is kept on a low heat throughout the meal. The trick is to ensure that the cheese stays melted but doesn't heat up to the point where it boils or adheres itself to the bottom of the pot. Long skewers are used to dip chunks of bread or cubes of potato into the gooey mixture. Traditionally, if your chunk of cheese or potato falls off into the dish you are expected to buy the next round of drinks. Regional variations involve using herbs, mushrooms or tomatoes in the mixture. Raclette (see below) is found throughout the country but originates in the Valais. A half-moon block of raclette cheese is impaled on a sling beneath a specially designed heater, which melts the flat top of the cheese. As it bubbles and melts, the cheese is scraped (raclï¿½) off onto a plate and eaten with boiled potatoes, cold meats, gherkins and pickled onions. In both instances if you find yourself becoming overly full but want to plough on through more cheese, rumour has it that if you down a shot of strong spirit such as Kirsch, the alcohol burns a hole in the accumulated cheese and allows you to manage a forkful or two more. 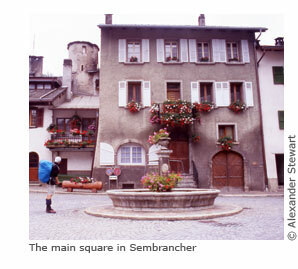 Synonymous with Switzerland, cheese here is savoured and celebrated. Traditionally a skill of mountain farmers, who created different types of cheese by hand whilst herding cows high on the summer pastures, there are now hundreds of dairies engaged in full-time production. Half of the country's milk yield goes into cheese production and although a small number of independent farmers in Alpine regions specialize in making the acclaimed Bergkï¿½se or Alpkï¿½se (fromage des alpes in French, formaggio di alpe in Italian) from raw milk processed from cows fed on alpine grass, wildflowers and clover, most cheese is produced using mechanized methods and sophisticated machinery. A system of quality-controlling cheese production has now been put in place. An AOC (Appelation dï¿½Origine Contrï¿½lï¿½e) label denotes that the cheese has been produced using traditional methods and ensures that anyone else using the names of the cheeses is liable to prosecution. For more information on the production of Swiss cheese, the history of various types of cheese and even a selection of recipes, visit www.switzerland-cheese.com. Emmental, made throughout the lowlands of German Switzerland, is the classic Swiss cheese. Nicknamed ‘mousetrap’ or simply known as ‘Swiss’ cheese by Americans, it is highly distinctive. The characteristic holes of the cheese are formed during the maturing process – the more symmetrical the holes, the more expert the fermentation. With a mild, subtle, nutty flavour it is very palatable and very popular. Gruyére is exported throughout the world as well as eaten extensively in Switzerland. Traditionally made in western Switzerland, the smooth, rich, creamy cheese is used in several recipes including fondue. A hard cheese, Gruyére has a mild flavour, described as doux, when young, and a more intense flavour, described as salé, when older. Raclette is the key ingredient of the classic eponymous Alpine dish (see above), since it melts easily, and as such is integral to many a social occasion. Originally from Valais, it's now made throughout the country and recognizable by its rich, slightly spicy flavour. Appenzeller, a series of three cheeses produced in the north-east, are amongst the most pungent and aromatic of cheeses produced in Switzerland. Enormously popular within the country, their reputation has perhaps unsurprisingly failed to travel well and they are largely unknown outside the Swiss borders. The three main sorts, Classic, Surchoix and Extra, have varying strengths according to how long they have been matured. Vacherin Fribourgeois, made exclusively in the canton of Fribourg, is characterized by a distinctive, full-bodied, slightly fruity flavour. This medium-soft, tender cheese melts easily and is often used as a variation in fondue. Swiss desserts tend to be meals in themselves. High in calories, they often include cream or ice cream. Apple pie (apfelstrudel) is ubiquitous, as are fruit-filled pastries. Less common is the deep-fried pastry concoction cuisses des dames (ï¿½ladies thighsï¿½). Meringue was invented near to Meringen and is often served covered in thick, rich cream. The Swiss are justly renowned for their chocolate production. Thanks to pioneers including François-Lois Cailler, Philippe Suchard, Daniel Peter, Henri Nestlé, Rodolphe Lindt and Jean Tobler, the country has developed a serious passion for chocolate. The names of these individuals live on in brands such as Nestlé, Toblerone and Lindt. The Swiss now export vast quantities of the smooth, creamy, cocoa-rich substance too. A string of awards attests to the quality of the chocolate produced, as does the fact that the Swiss are now thought to eat more chocolate per person than anyone else in the world, some 11.5kg every year in comparison to around 9kg in the UK and 5.5kg in the United States. For background information and a comprehensive history of Swiss involvement in the production and popularization of chocolate, see : www.chocolat.ch. In general, tap water in Switzerland is clean enough to drink. This is also true of the water fountains found in many small towns. In addition, the Swiss produce a number of bottled mineral waters: brands include Valser, Henniez, Fontessa and Aproz. Coffee tends to be more popular than tea, which is usually served without milk. Iced tea (eistee in German, thé froid in French, te freddo in Italian) is popular during the summer. Hot chocolate is also popular but is often just made from a sachet of powder. All of the usual soft-drink brands are represented in addition to the locally produced Rivella, made from lactose, a by-product from the production of cheese. Three types of Rivella are available: red label is the original version, blue label has reduced sugar content and the green label is mixed with green tea. Unsurprisingly, German-influenced Switzerland has the largest consumption of beer in the country, although interestingly the rate of liver cirrhosis is considerably higher in the French and Italian cantons than in the German counterparts. In pubs and bars, lager comes either in bottles, 300ml or 500ml, or on tap (vom Fass in German, à la pression in French, alla pressione in Italian) in measures ranging from 1dl to 5dl. The most common are the 3dl Stange, which is the equivalent of about half a pint, and the 2dl Herrgï¿½ttli, which equates to about a third of a pint. Standard alcohol content is 4.2 to 5.5%. Equally unsurprisingly, most wine production is carried out in the French-influenced cantons, especially in Valais and around Lake Geneva. What is surprising is the quality of the production, which amounts to almost 200 million bottles per year, and although only around 1% of Swiss wine is exported, its reputation is growing: in 2000, Swiss wines scooped medals in a number of international competitions. Much of the country's finest wine comes from the steeply terraced region of western Valais, north of the Rhï¿½ne. The majority of quality wine produced is the bright, dryish white Fendant, made from the Sylvaner grape, which is most often drunk as an accompaniment to fondue or raclette or as an aperitif. Other white wines worth trying include Johannisberg, Petite Arvine and Amigne. The most common red wine is the full-bodied Dï¿½le, made from a blend of Pinot Noir and Gamay grapes. Alternatively, try the varieties made from Humagne Rouge, Syrah or Pinot Noir grapes. Dï¿½le blanche is one of the country's few ros's. The Valais also produces a couple of decent dessert wines, including the Pinot Gris-based malvoisie and muscat. The most notorious spirit is undoubtedly absinthe. Known locally as la fï¿½e verte or the Green Fairy, it was banned in Switzerland until March 2005. Up until this time quantities had been produced illicitly in small presses primarily in the Neuchï¿½tel canton. Following legalization, the drink has grown in popularity and around ten types are currently produced using valley-grown wormwood. Alcohol percentages vary from 50% to a mind-blowing 75%. Approach with caution! Scarcely less toxic are the various locally produced fruit brandies and schnapps. Kirsch is distilled from compressed cherry pits; Damassine is made from prunes; Grappa from grape skins, stalks and pips; Williamine from pears and Pflï¿½mli from plums. Appenzeller Alpenbitter (Alpine Bitters) is derived from the essence of more than sixty different flowers and roots.